As members of the ACA (American Camp Association), we meet and exceed the highest safety standards in our industry. When you send your child to Ivy League, you can feel confident knowing that we have a full-time medical staff led by a registered nurse equipped to handle all medical concerns and food allergies. 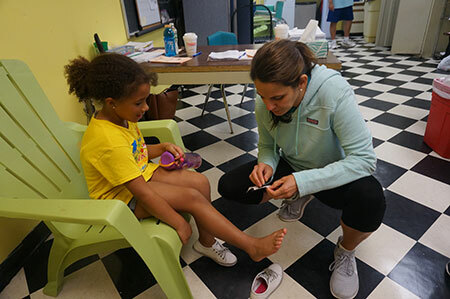 Our caring and skilled medical personnel are at camp at all times to meet each child’s needs. In the past the medical staff has managed the glucose levels of diabetic campers. The camp welcomes children with special diets. We manage all our kitchens allergens and do not allow outside food on to the campus. Our Camper Care Specialist goes over with Parents prior to the summer to customize a specialized daily menu for our campers with special and allergen free diets. Ivy League Day Camp only uses Red Cross certified Water Safety Instructors to teach swimming. These staff members have taken a 40-hour class going over the proper teaching techniques for swimming. Our Red Cross certified Lifeguards make sure the aquatic environment is safe. Ivy League Day Camp is proud to employ all of our bus drivers. Each year we Red Cross certify each Bus driver in CPR and Epi Pen training. Each bus also has a bus counselor to entertain and comfort the campers on the bus as well as make sure the children are safe.